Oil money is rolling into Kazakhstan, and new architectural landmarks in the capital city, Astana, reveal the country's economic aspirations. Jonathan Fryer recently visited the central Asian country and witnessed how President Nursultan Nazarbayev's ambitions are omnipresent there. 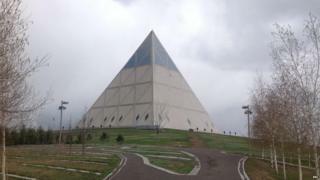 The 62m (200ft) high Palace of Peace and Harmony rises out of the stubbly grey grass of one of Astana's parks as starkly as the pyramids in the sands of Giza. Even if it is not as colossal as its ancient Egyptian counterparts, Norman Foster's concrete and glass pyramid is awe-inspiring - not least on the inside. It contains a 1,500-seat opera house, as well as conference rooms of various sizes. It would be easy to get lost, were it not for the solicitous young female attendants - looking just like air-stewardesses - who shepherd visitors around. There's one circular hall where 200 religious leaders gather every three years to discuss the state of the world. But my favourite spot is right at the top, at the point of the pyramid, where smaller meetings are held; the room is lit by pale blue, white and gold stained glass windows depicting doves against the sky. To get up there, one has to mount a broad staircase, lined with a wall garden which has both temperate and tropical flowers in bloom. "Actually, some of them are plastic," my young guide whispered to me, as we climbed up the other day. "Not all plants can survive our climate." Kazakhstan's climate is indeed extreme, thanks to its location in the centre of the Asian continent. In Astana, the brand-new purpose-built capital in the middle of the country, the temperature can be -35C in winter and 35C in summer. No wonder most of the land around is wind-swept steppe. The city is an act of defiance against the constraints of nature; an almost Victorian life-affirming statement that human beings can control their destiny. Indeed, under the direction of President Nursultan Nazarbayev, who has held an iron grip on Kazakhstan since it broke away from the disintegrating Soviet Union in 1991, the country is determined to figure among the world's 30 leading economies by the year 2050. That's despite having a population of fewer than 20 million. "We will make it!" an enthusiastic university student, Nurgul, tells me, as we sit eating the local equivalent of fast food in another giant Norman Foster construction: a shopping centre inside a translucent tent, inside which the trains of a roller coaster rattle over our heads. The reason for such confident optimism is Kazakhstan's vast oil and gas reserves, especially along and underneath the Caspian Sea. Even with lower oil prices the money keeps rolling in. Yet the government is determined to be a world leader in renewable energy as well. On a building site opposite Astana's Nazarbayev University, there is a hive of activity, with cranes, trucks and men in bright yellow hard hats everywhere, putting together Expo2017 - an international specialised exhibition that will focus on future energy. Over 100 countries are expected to take part. One burly young construction worker, Nurzhan, told me proudly that this will open Kazakhstan to the world. He said that in the recent presidential elections he had voted for septuagenarian President Nazarbayev; according to official figures, 97.75% of the population did. No strong opposition party is allowed, and dissent is stifled. Nursultan Nazarbayev himself is omnipresent in Astana, as the acknowledged architect of independent Kazakhstan. On election day, I watched him vote in the People's Palace, to polite applause from other voters queuing to cast their ballot. But one gets a better sense of his standing from the top of the Bayterek Tower - a symbolised slender poplar, a tree of life with a globe settled in its uppermost branches. In the middle of the viewing platform 100m up there is a podium, with a gold imprint of the president's hand embedded in a lectern. Visitors are encouraged to place their own hand over the presidential imprint and to look out, down the impressive avenue of gardens and public buildings to the neo-classical presidential palace and Norman Foster's pyramid beyond. "This way you can send a message to the president," an attendant urged me as I mounted the podium. My telepathic powers failed me at that moment. But there is no doubt that Mr Nazarbayev is a man with a mission and that he is determined that nothing and no-one shall stop him. BBC Radio 4: Thursdays at 11:00 and Saturdays at 11:30. BBC World Service: At weekends - see World Service programme schedule or listen online.